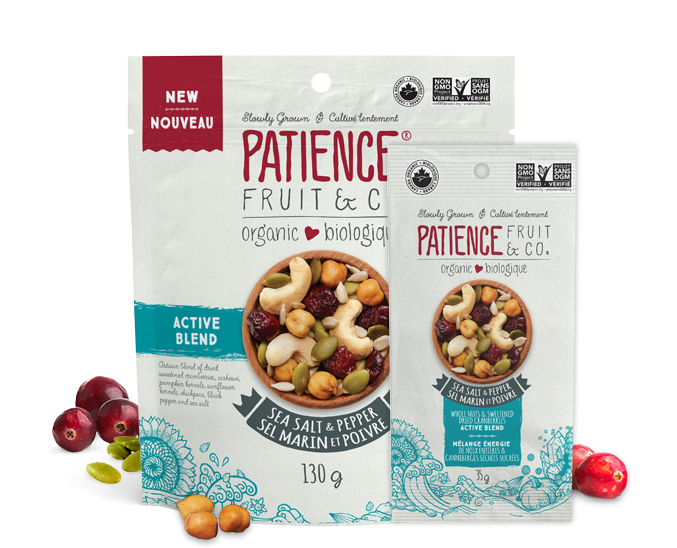 This blend of dried cranberries, cashews, pumpkin seeds, chickpeas, sunflower seeds, sea salt and pepper balances sweet and salty in a way everyone will love. A savvy touch of pepper brightens up your snack time. INGREDIENTS : Dried cranberries* (cranberries*, cane sugar*, sunflower oil*), roasted whole cashews*, roasted pumpkin kernels*, roasted chickpeas*, roasted sunflower kernels*, sea salt, sunflower oil*, black pepper*. (*Organic). May contain : Milk, soy and other tree nuts. 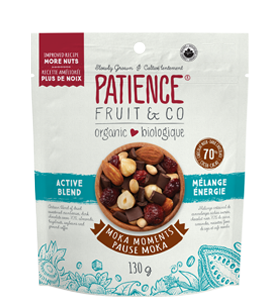 This tasty blend generously showcases the delicate flavours of cranberries and nuts. The made-in-heaven combo of sea salt and pepper takes everything to a whole new level, perfect for happy hour or TV binge-watching. Polyphenols are naturally present in the cranberries used in this blend. 180mg of polyphenols per 50g serving or 126mg per 35g serving. By itself of course! Adventurous gourmets might also want to add it to a quinoa salad or whatever else comes to mind. Whether you’re out on a hike, on the way to work or just lounging about on the sofa, you’ll love all three flavours in our Active Blends line! Made from whole nuts, grains and dried cranberries, they’re a super source of energy, giving you that boost it sometimes takes to get work and activities crossed off your list. Available in two sizes, 130g and 35g, to satisfy those sudden cravings. 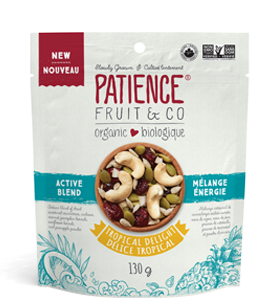 This blend of dried cranberries, cashews, pumpkin seeds, sunflower seeds and coconut is crunchy, fresh and zesty. The generous flavour of 70% dark chocolate forms the luscious top note in this blend of dried cranberries, dark chocolate, almonds, hazelnuts, soybeans and ground coffee.